My first experience with Final Fantasy X came not from playing the game itself but rather in listening to its soundtrack. A few months before the PlayStation 2 game made its way to the U.S., I popped the imported soundtrack CDs into my computer expecting the usual pleasant Nobuo Uematsu fare. Instead, I found myself bewildered when a shrieking piece of nu-metal blasted my ears just a few minutes into the first disc. It was especially jarring given the way everything until that track had sounded so quintessentially Final Fantasy-like. From the delicate piano melody of the title screen music to a spacey remix of the series' traditional prelude, it all seemed par for the course. And then, all of sudden, BAM: Grinding guitars, thudding drums, and a "singer" seemingly trying to enunciate while simultaneously gargling shards of glass. "Otherworld" – the nu-metal tune in question – definitely wasn't what I expected from a Final Fantasy game. This was a series whose scores dabbled in progressive rock pastiches most of time, sure, but when the music strayed from those '70s rock roots it almost always drifted toward classical homages: The opera sequence from Final Fantasy VI, the Carmina Burana nod in "Exdeath's Theme," that sort of thing. Rob Zombie impersonations, on the other hand, really represented a sort of paradigm shift. And perhaps fittingly so, given that FFX was the first chapter of the series to incorporate next-generation elements like voice acting and fully 3D visuals. Like the best remasters, FFX | X-2 HD looks like you remember the games looking, not the way they actually looked. Much as it stood out, though, "Otherworld" wasn't meant to be the song you noticed when you played FFX. That honor belonged to "Suteki Da Ne" (aka "Isn't It Wonderful? "), the game's obligatory love theme, which Squaresoft clearly hoped to turn into a smash. After all, Final Fantasy VIII's love theme "Eyes on Me" had been a runaway hit in Asia – you'll find it on practically every karaoke machine made in the past 15 years – and with "Suteki Da Ne" they clearly aimed to bottle up some more of that lightning. But it was an uninspired tune – insipid. It lacked the punch of "Eyes on Me" in part because the idea of a vocal pop song in an RPG was no longer surprising, and in part because it was wasted on an unconvincing "romance" scene. "Suteki Da Ne" underscores the moment at which the protagonist Tidus and his love interest Yuna finally admit their feelings and make out while drifting hand-in-hand through the water, or space, or something. Yet FFX allows you, through dialogue choices, to ignore Yuna and build a relationship between Tidus and one of the other female party members instead. I had spent the entire game brushing off the "canon" romance whenever possible in order to flirt with goth-sorceress-by-way-of-Louise-Brooks-homage Lulu. When Tidus and Yuna started kissing, "Suteki Da Ne" just made Tidus look like a faithless creep. Lulu was the kind of girl who would have preferred "Otherworld" anyway; a woman who dresses in gloomy gothic furs while living in a tropical island town clearly isn't trying to fit in. Yet she looked perfect for her role as the party's black mage. Similarly, "Otherworld" really was an unusual song for Final Fantasy, but it somehow worked perfectly within the actual context of the game. You hear it twice in FFX – once at the beginning and once at the end – and in both cases it's closely tied to the running plot element of the in-game sport of Blitzball. Blitzball is every bit as grating and messy as the song, so the two fit together quite well... especially the second time "Otherworld" shows up, in the battle that serves as the story's climax. Final Fantasy X-2 maintains such a breakneck pace you may not have time to stop and fully appreciate how absolutely weird it is. Square may have wanted "Suteki Da Ne" to be FFX's big breakout hit, but for me "Otherworld" captures the essence of the game far more effectively. FFX itself is an exercise in excess, one of the most lavish and expensive video games of its era; yet at the same time, it's also much smarter than it appears at first glance. "Otherworld" perfectly demonstrates FFX's ability to bring together elements that shouldn't work, or that fall flat when experienced in isolation, and somehow make them work. Revisiting FFX through the HD Remaster, I've found myself constantly surprised at all the little things that simply fall into place throughout the game – how smoothly it works, despite its patchwork content. At heart, FFX doesn't fall far from where Final Fantasy XIII would end up a few years later – it's an extremely linear adventure, with a small cast traveling together under the geas of a pressing obligation – but it feels much closer in spirit to the classic definition of "Final Fantasy" than that sequel. But that's only because it was better at hiding its changes beneath a fan-friendly veneer. 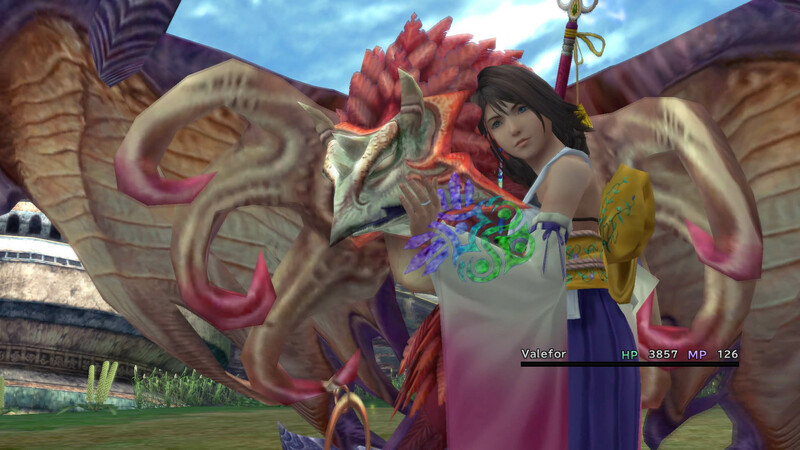 Under the surface, FFX abandoned a great many Final Fantasy traditions. It threw out the Active-Time Battle system in favor of turn-based combat inspired most heavily by strategy games. It broke up key dungeons with block-and-key puzzles. It hid its most powerful weapons not behind intricate sidequests but rather irritating minigames. But even when FFX stumbles over a strange design decision – and those stumbling blocks haven't changed in this HD remake – it still holds itself together. The spectacular battle system plays a huge part here; it may be the finest in the series. Despite only allowing you to field three characters at a time, the ability to rotate in an inactive character instantly and with no penalty completely transforms the feel of combat, at once making it tactical while doing away with the sensation that certain party members are of less value than others. 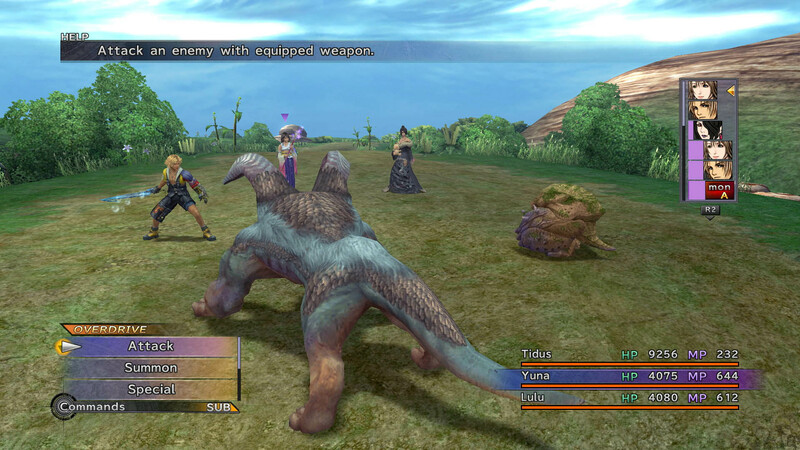 Each character in your team possesses innate skills (irrespective of how you choose to build them through the Sphere Grid system) that work in specific situations – for example, Wakka's ranged attacks make him a beast against flying foes, while Rikku's savvy with machines allow her to destroy most mechanical enemies in a single blow. 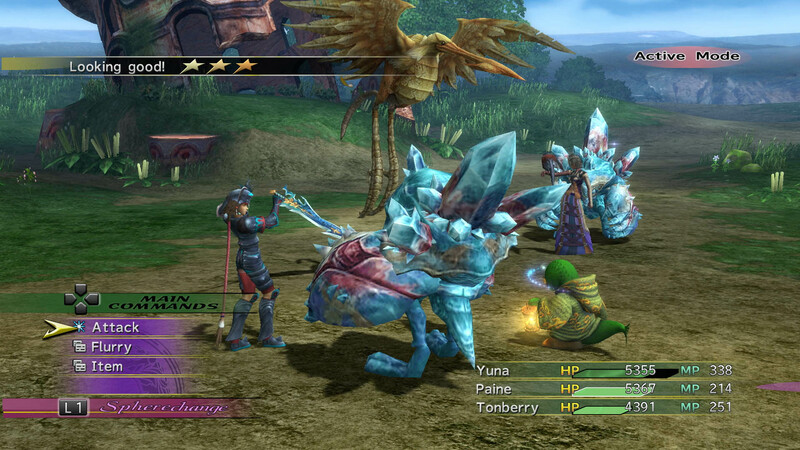 And Yuna can summon tie-dyed chickens. All of these changes make FFX more like "Otherworld" than "Suteki Da Ne." The game is at its weakest when it's sleepwalking through stock Final Fantasy beats. The obligatory villain, Seymour Guado, comes off as little more than a pointless irritant in light of the far greater threat posed by the entity known as Sin. The obligatory romance feels false when the game lets you cultivate other relationships through your few active dialogue choices. The obligatory superbosses (new to American players in this version of the game) are hardly worth the effort, since they effectively require you to complete those godawful minigames to unlock the ultimate weapons. No, FFX excels only when it's breaking from tradition. It lets you fight bad guys with a system derived from Front Mission. Tidus' conflicted feelings about his father make for the most interesting relationship in the game, exploring a family dynamic the series has never really addressed before or since. And of course fighting a godlike being flanked by bizarre herky-jerky with "Otherworld" blaring in the background transforms the game into an almost hallucinogenic experience, similar to flipping through late-night television and stumbling into the middle of some surreal foreign video on MTV. And what of the sequel? Final Fantasy X-2's big song is a piece of lightweight electronic pop fluff called "Real Emotion" – and in that case, the big tune definitely fits the game. FFX-2 was an inessential sequel that shattered the intriguing ambiguity of FFX's ending, but despite never needing to exist, it manages to be a lot of fun anyway. Not only does it not take itself particularly seriously, it makes the most of its nature by using its own superfluity as an excuse to experiment with ideas that openly challenge the series' long-standing conventions. Its mission-based structure echoes the MMO stylings of later Final Fantasy entries without trying to feel like an MMO. 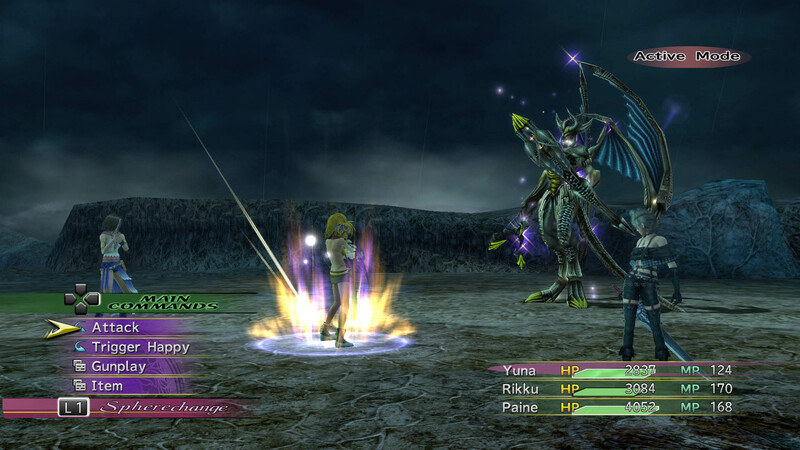 Its on-the-fly Dress Sphere combat transitions and overlapping battle actions paved the way for FFXIII's battle mechanics. Not every creative choice in FFX-2 paid off – the conditions for the "perfect" ending are ludicrously obscure – but the game made the most of its weird place in the series' canon, and it actually comes off better in hindsight than it did in its time. The wild permutations the franchise has undergone over the past decade make FFX-2 seem less like an outlier and more like a pioneer. Both games include new material, including optional super bosses that force you to exploit every in-game system to its fullest. As a compilation, this HD Remaster doesn't make radical changes to either game. The "new" content, including the full-scale roguelike bonus game Last Mission, is actually taken from the "International Version" rereleases published in Japan a decade ago. The HD remaster boasts new musical arrangements but stops short of re-recording character dialogue. The obvious graphical improvements on display don't include new animations, so everyone looks like they stepped out a late-era PS3 game but moves like they stepped out of an early PS2 game. It's a strange remaster in that it goes well beyond the call of duty in some respects, and those high-spec additions only serve to make the untouched original material feel all the more dated. "Otherworld" and "Real Emotion." Misfit rocker and lightweight fluff. That's the sum total of Final Fantasy X and X-2, even as remasters. It's a strange pairing, but it works – and in some ways it works even better today than when the games were first released. Visuals: New models and textures means that even running uprezzed through a PlayStation 2 emulator, these games have never looked this nice. As a side effect, though, the old-school animation seems all the more dated. Sound: Some people will like the rearranged soundtrack, while others will hate it. Personally, I wish they'd put the effort into rerecording the voice work. Interface: Functional and clean, but even upscaled the menus and dialogue boxes look tragically frumpy. We're living in a post-Persona 4 world, for god's sake. Lasting Appeal: Two solid RPGs for the price of one is a tough deal to beat, and even people who know the original versions inside and out will want to check out the new material. Two classic RPGs in a single package. As games, they're enjoyable; as historical artifacts, they say a great deal about the different directions Final Fantasy would take in the following years. Despite the visual update and the "new" material, this anthology falls just short of essential, but games don't have to be great to be worth playing. Sometimes, entertaining is enough. Tagged with classic,	finalfantasy,	Puzzle,	Remaster,	Reviews,	squareenix,	Virtual Reality.